Gourmet Specialty Coffee - how to find it, choose it and brew it. When it comes to coffee, taste can be subjective. But as with fine wines, when your train your taste buds you'll find yourself being able to identify and enjoy a really good coffee. The more quality coffees you try, the better you'll become at identifying the different flavors you get from coffees that come from different parts of the world. Over time, tasting coffee will become an adventure. If you like the flavor of the coffees you buy in your local coffee shops, and want the same quality in the coffee you brew at home, follow these guidelines. And when you buy good coffee beans, be sure to get the right equipment to bring out the best in them. Ripe Arabica coffee cherries on the tree. When you buy coffee at a coffee shop like Starbucks, from any other coffee shop or supermarket - or buy online - read the label and make sure you’re buying Arabica coffee beans. However, if you buy from a deli, particularly an Italian deli, read the label and make sure it’s 100% Arabica, and not Robusta. The Italians have a thing for Robusta beans. This isn't because Italians don't like quality coffee, it's just that they love espresso, and many espresso blends include Robusta beans. Separately, in any supermarket, read the labels of some of the cheaper blends. They may well contain Robusts beans as well. 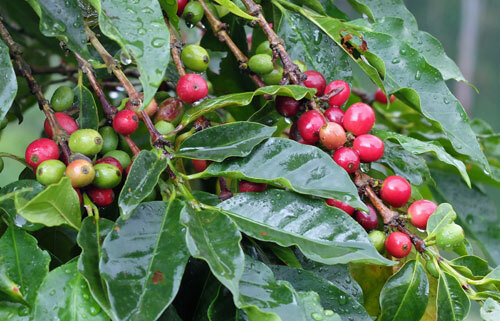 What’s wrong with Robusta coffee beans? Why? Because a lot of the flavor of a great cup of coffee comes from the oils in the bean. 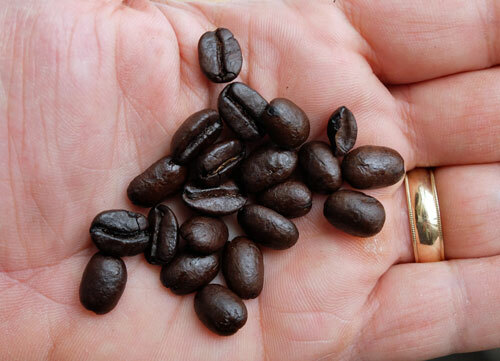 You may have noticed how dark roasted coffee beans can have an oily surface. This oil is volatile, and the moment it is exposed to oxygen, it starts to degrade. So buy whole beans and make sure they are sealed in an airtight bag, preferably one that has a one-way valve. When you buy ground coffee, some of those volatile oils will have evaporated during the grinding process. Tip: You know those coffee bean self-serve bins in the supermarket? They are definitely not airtight. And that means the finer flavors of those coffees have been quietly evaporating, sometimes for days and days. 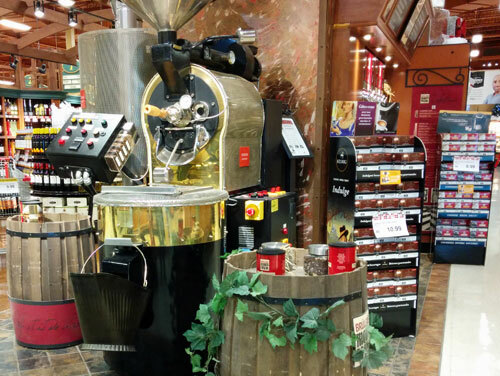 A coffee roasting machine in a supermarket. Maybe you’ve been to a coffee shop that does its own roasting. If you have one close by, lucky you! Why? 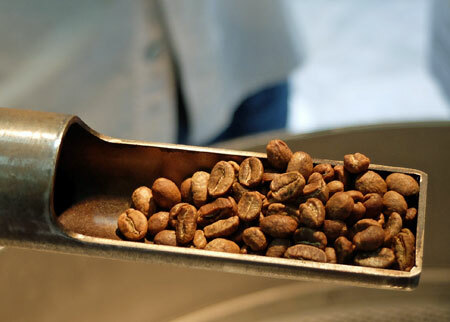 Because coffee beans begin to lose their flavor from the moment they come out of the roaster. (Those volatile oils begin to break down immediately.) So if you can buy beans that have just been roasted, you have a big advantage. Another option is to buy fresh-roasted coffee online. Do you like your coffee strong or mild? This can get confusing, as the word “strong” can be interpreted in a number of different ways with coffee. Here’s the simple and accurate answer...if you want a stronger cup of coffee, just increase the proportion of ground coffee to hot water. The more ground coffee, the stronger the results. However, as you learn more about coffee and various coffee beans and blends, you will find that some beans have a “stronger” taste than others. You’ll also find that the fineness or coarseness of the grind makes a difference too. As does the darkness or lightness of the roast. Enjoying gourmet specialty coffee is a journey...and in time you’ll come to discover all the different tastes you enjoy, from strong to mild and everything in between. Are you ready to start brewing? Not yet! Be sure to read the section on choosing the best coffee makers. Using the wrong coffee maker in the wrong way can reduce even the finest gourmet specialty coffee to a brew that will make you wince. Also, if you want some help in finding a reputable web site where you can order your coffee online, follow the tips on our Online Coffee Store page. Finally, if you want to dig a little deeper and find out more about gourmet coffee and some of the world's major growing regions, see below for links to some additional information. Gourmet coffee blends vs. single origin coffees.